Sure, today we have SonicCare, but really, that's nothing new. 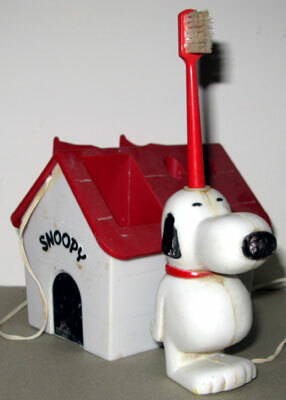 Back in the 1970s we had the Kenner Snoopy Electric Toothbrush, which was super-cool because it came with a doghouse that held the brushes and a giant Snoopy who was the handle. Good grief, it's time to brush your teeth! Charles Schulz merchandised the heck out of that strip, and we don't resent him one penny. Everyone we knew had one of these doghouse toothbrush thingies at one time or another it seemed, but eventually it broke and you went back to a regular toothbrush that wasn't electric. Did you have one of these? Any memories? Useful right after making a sugary treat on your Snoopy Sno Cone Machine! In the early '70s I was obsessed with all things Peanuts, so I was thrilled with the Snoopy Toothbrush I got one Christmas. Problem was, as a toothbrush it totally sucked. The motor wasn't powerful enough to drive the brush properly (as I recall it was battery-operated), and the brushes fell apart quickly. Mine lasted only a few brushings before I resigned myself to the fact that it was more fun to look at and play with than actually brush with. Everyone I knew -- even non-Peanuts-fanatics -- had one, and it spawned a line of other motorized toothbrushes based on cartoon and comic-book characters. I like to think a silver lining might have been that it got an entire generation of kids into good brushing habits. It also made me realize that a lot of the licensed Peanuts merchandise was, unfortunately, junk. Yeah, I had one, and hated brushing my teeth with it, so I just played with it instead. I often think about this toothbrush. It broke shortly after I got it and I tried taking it apart to fix. I gave it to a neighbor to try to fix but don't think I ever got it back. I always wondered and realized the neighbor prob threw it out because I it wasn't possible to fix. I'm glad to know others commented that theirs broke also,I thought maybe it was just me being careless. The pics certainly bring back memories!